Pyongyang, translated into English, means flat land. Once the ancient capital of the Choson, Koguryo and Koryo kingdoms, Pyongyang remains the capital of contemporary North Korea. After the destruction caused by the Korean War, Pyongyang has become completely modernized with towering skyscrapers, wide illuminated boulevards and relaxing green parks. Department malls, recreational centers, restaurants and draft beer bars sit between the revolutionary museums, imposing monuments and colorful murals that scatter the city. Pyongyang is home to the Workers’ Party of Korea and has become the most elaborate showpiece of the national Juche ideology. Although North Korea may be mysterious to many of us, this city is ready to show itself to the world. Here are our top 20 must-see sights on a group tour or private tour with us to Pyongyang, the capital of North Korea! 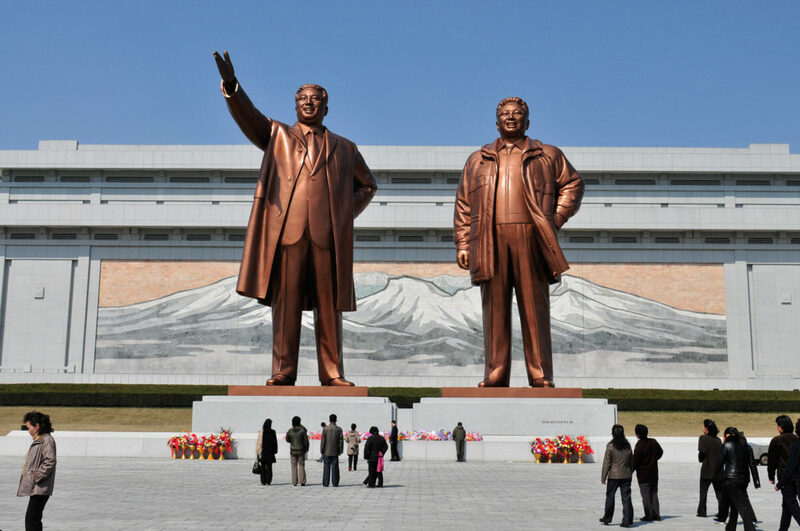 The Mansudae Grand Monument is an iconic memorial most notable for its formidable bronze statues of Kim Il-Sung and Kim Jong-Il. Each statue stands at 22 meters tall. It’s here that men, women, and children will make a visit to lay flowers at the feet of the past leaders who are seen as guiding fathers to the Korean people. It’s customary to line up and bow in front of the statues, a Korean form of greeting and a showing of respect. Photos are permitted, but you are advised not to mimic the Great Leader’s pose or to cut off any part of the statues in the frame. Kim Il-Sung’s statue was once the only resident of Mansu Hill, but after Kim Jong-Il’s passing in 2011, a similar statue was erected in his honor and Kim Il-Sung’s facial expression and coat were altered to reflect a smiling grandfatherly image. Soon after, Kim Jong-Il’s coat was renovated into the signature parka he wore on field guidance trips. With a mosaic backdrop of Mt. Paektu and tributes to the ‘Anti-Japanese Struggle’ and ‘Socialist Revolution’ on either side, Mansudae Grand Monument is the most sacred of its kind in North Korea and our number one must-see. Kim Il-Sung Square is the major public space at the heart of Pyongyang. 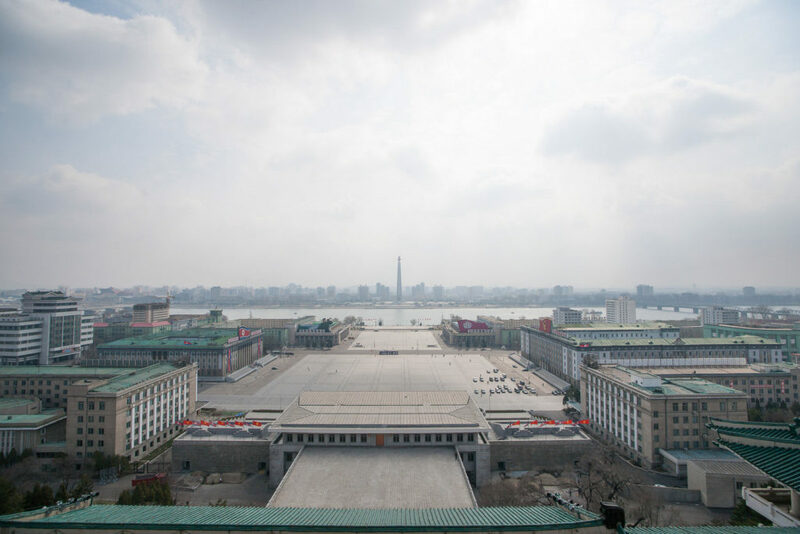 Similar to China’s Tiananmen Square, North Korea hold their well-publicized historical events, mass dance celebrations, military parades and even firework displays here. 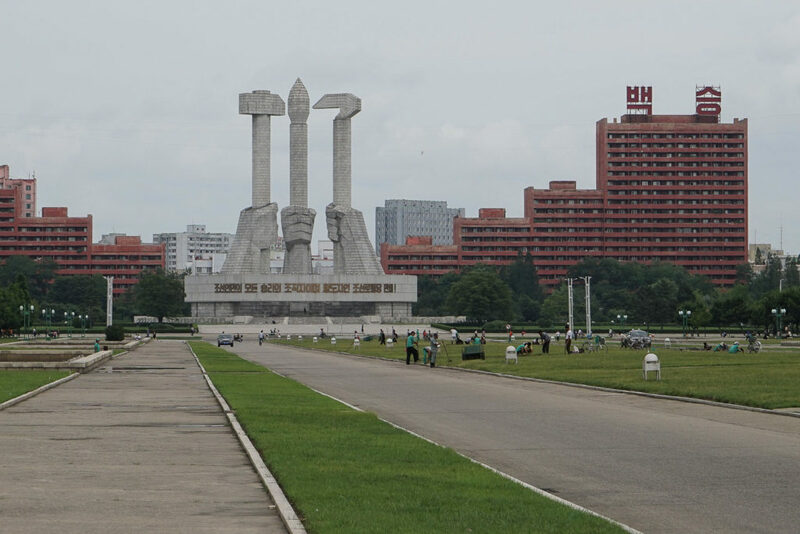 If you’ve seen goose-stepping North Korean soldiers on television, then you’re familiar with Kim Il-Sung Square. 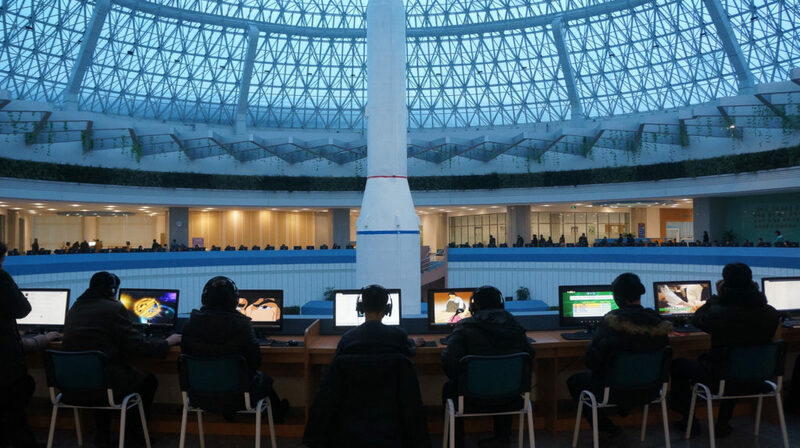 The area can accommodate a massive 100,000 people and is surrounded by high-profile ministries, most notably the Worker’s Party of Korea headquarters. Other buildings on the square include the Grand People’s Study House, the Korean Central History Museum and the Korean National Art Gallery. You’ll get a fantastic view of the Tower of the Juche Idea across the river. If you’re in Pyongyang on one of our tours over a public holiday, we’ll often get to witness special festivities right on location. Opposite the Kim Il-Sung Square perched on the riverbank, you’ll spot the imposing Tower of the Juche Idea. This is North Korea’s tallest monument. This obelisk commemorates the state ideology of ‘Juche’ developed by Kim Il-Sung. ‘Juche’ is loosely translated as ‘self-reliance’ and is otherwise the foundation to the political and economic isolationism of North Korea today. Exactly 25,500 granite blocks make up the Juche Tower, each representing a day in the life of Kim Il-Sung by his 70th birthday. At the tower’s entry, the local guide will show you a wall of plaques and tributes from those supporting the Juche ideology internationally. When we visit, we’ll take you to the top and you’ll get the best views of Pyongyang all to yourself. This is generally the first site you’ll visit after reaching Pyongyang. The Arch of Triumph is not to be confused with the 10-meters-shorter Arc De Triomphe in Paris and was built in the exact spot Kim Il-Sung was met with thundering applause upon his return from victory over the Japanese and liberation of Korea. Kim Il-Sung became determined for liberation by 1923, but it wasn’t until 1945 that he became successful. These dates are now immortalized on the arch itself, as is the poem “Song of General Kim Il Sung”, a piece recited on State television every day. The Arch of Triumph is a spectacle to drive under at night and as of recently, we can even take you up an elevator to get a clear view of the nearby Kim Il-Sung Stadium. The Monument to Party Founding was built in 1995 to commemorate the 50th anniversary of the Worker’s Party of Korea. The Worker’s Party of Korea is the founding and ruling party of North Korea helmed by Kim Jong-Un as Chairman. The party is credited with the victories of the Korean people and this accolade is idealized in the monument’s design. The hammer, sickle, and brush represent the idea that individuals themselves hold the key to North Korea’s prosperity under Juche. To the front of the monument is a landing area known to host mass dance and celebration. 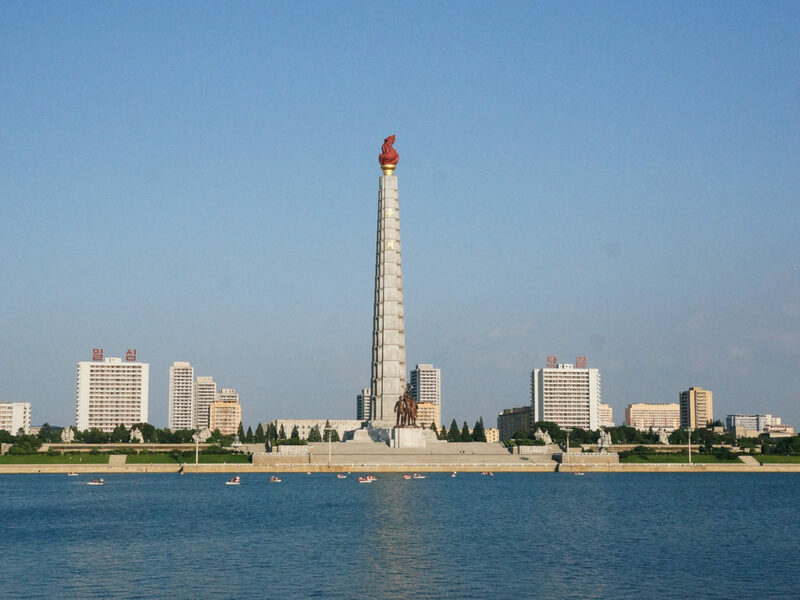 The red buildings behind represent the waving flag of the Worker’s Party of Korea and are topped with the words “Ever Victorious”. This is a Postcard-Pyongyang selfie you’ll never forget. 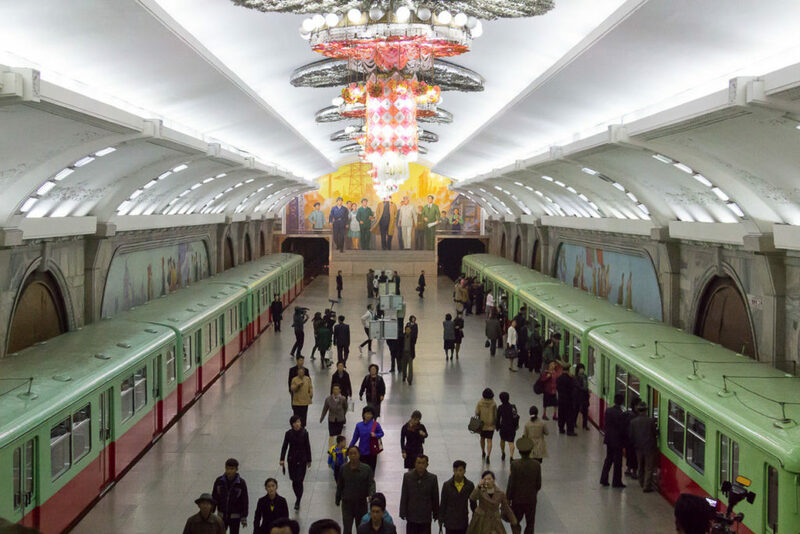 The Pyongyang Metro isn’t just the deepest metro system on earth, it’s also a nuclear bunker with purpose built blast doors, and an ultra-nationalistic museum of North Korea’s revolutionary history, ideals, and achievements. Each station is uniquely themed. The ‘Golden Soil’ station celebrates agriculture by showcasing murals of wheat harvests and fresh fruit, while the walls of ‘Construction’ station include mosaics of smiling labourers at work as Kim Il-Sung offers field guidance. Statues, bronze plaques, and ornaments scatter the platforms. Transiting here just as 700,000 locals do each day will mean leaving with a stronger understanding of what it means to be North Korean. 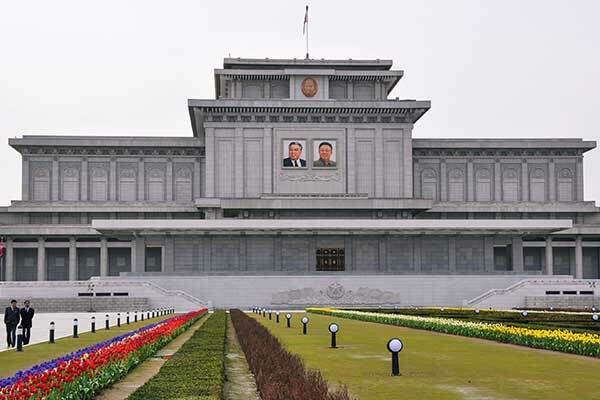 The Kumsusan Palace of the Sun is the final resting place of Eternal President Kim Il-Sung and General Kim Jong-Il. Inside separate rooms, their embalmed bodies lie presented inside climate-controlled clear glass sarcophagi for public viewing. Visiting the Kumsusan Palace of the Sun is a formal affair; men will require a collared shirt, tie and trousers and women must dress modestly with shoulders and knees covered. Photography isn’t permitted. Prior to entry, you will go through metal detectors, have your shoes cleaned and walk through purpose-built dust blowers. It’s mandatory to bow before each Great Leader three times. Many of the leaders’ most prized possessions are also on display, including a yacht, Mercedes, golf cart and train carriage. This is a somber yet surreal visit that may just define your trip to North Korea. The Palace is open just twice a week and closed in May and June, so on a short visit to North Korea, make sure it’s included! The Victorious Fatherland Liberation War Museum is a newly renovated exhibit of the Korean people’s fight against foreign invaders. 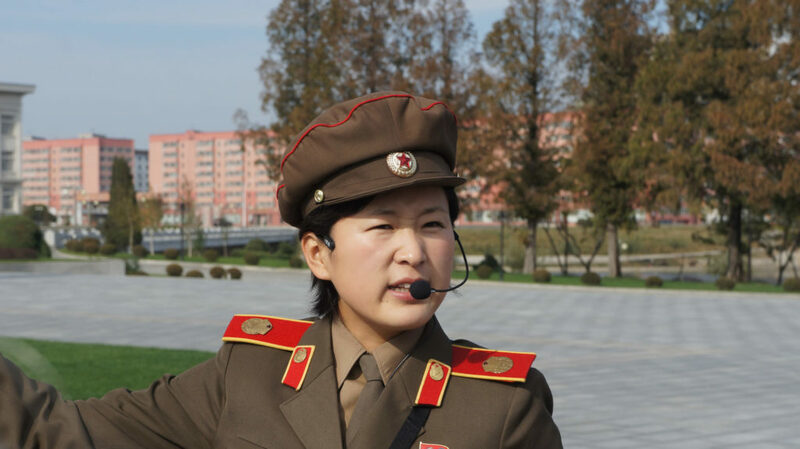 You’ll be assigned a female military-guide and she will provide you with a North Korean version of history that’s generally left unheard or discredited. The museum is filled with historical photography and video, expansive dioramas, remnant displays and an otherwise incredible attention to detail. Before entering, you’ll see captured US Army helicopters, shot down US Army planes and even the infamous USS Pueblo, America’s ‘Spy Ship’ still held hostage by North Korea that you can board and inspect for yourself. The Mansudae Art Studio is the largest and most prestigious fine arts studio in North Korea. Its state artists have mastered the socialist-realist style and since 1959, have provided North Korea with their ubiquitous monuments, statues, murals, posters and even lapel pin designs. The hereditary Kim leadership endorses this studio exclusively to depict their likeness, so on any itinerary to Pyongyang you’re likely to become a connoisseur of their works. We’ll visit a gallery here and you’ll have the chance to buy the ultimate North Korean souvenir for your lounge room wall. Nestled privately inside a tranquil park you’ll find Mangyondae Native House. This modest straw-thatched home is Eternal President Kim Il-Sung’s official birthplace and where he spent his childhood. He was born on April 15th, 1912, but in North Korea this year is better known as Juche 1, the North Korean calendar year is pivoted off Kim Il-Sung’s birth. 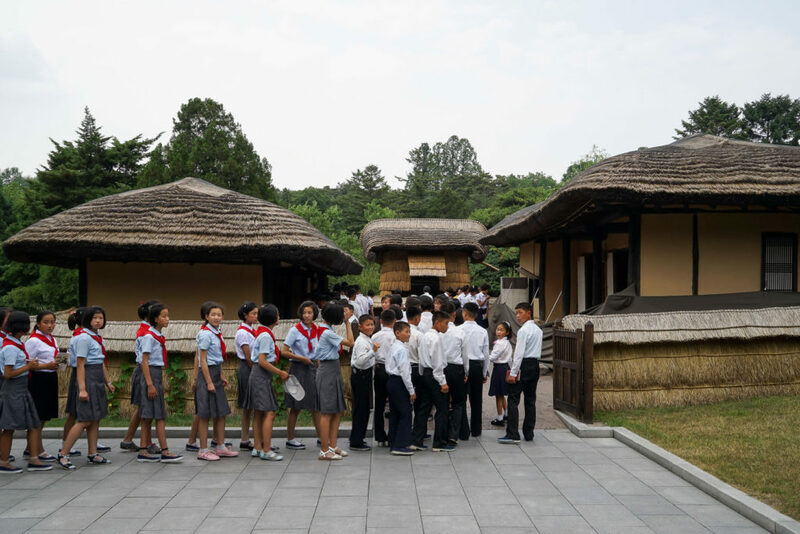 Your visit to Mangyondae Native House will likely be shared with school groups eager to catch a glimpse inside the early years of their Eternal President. It is customary to lay flowers at the Kim Il-Sung memorial plaque outside. Munsu Water Park is a massive international standard water park, possibly the last thing you’d expect to see in Pyongyang. 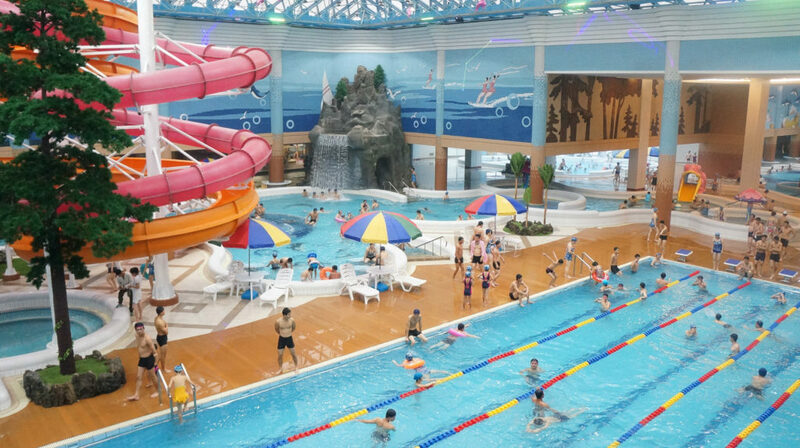 In the lobby, you’ll first be greeted by a wax likeness of Kim Jong-Il smiling by the seaside, then you’ll be handed a socialist-style bathing suit and let loose to make a splash with the locals. There is a myriad of vibrant water slides, an Olympic-sized lap pool, an ocean wave pool and even a lazy river to float down. If swimming isn’t your thing, you’ll find a rock climbing wall, volleyball courts, trampolines, a draft beer hall, and coffee shop, even a barber to get yourself a haircut! After a long day of sightseeing in Pyongyang, Munsu Water Park is a welcome change of pace. 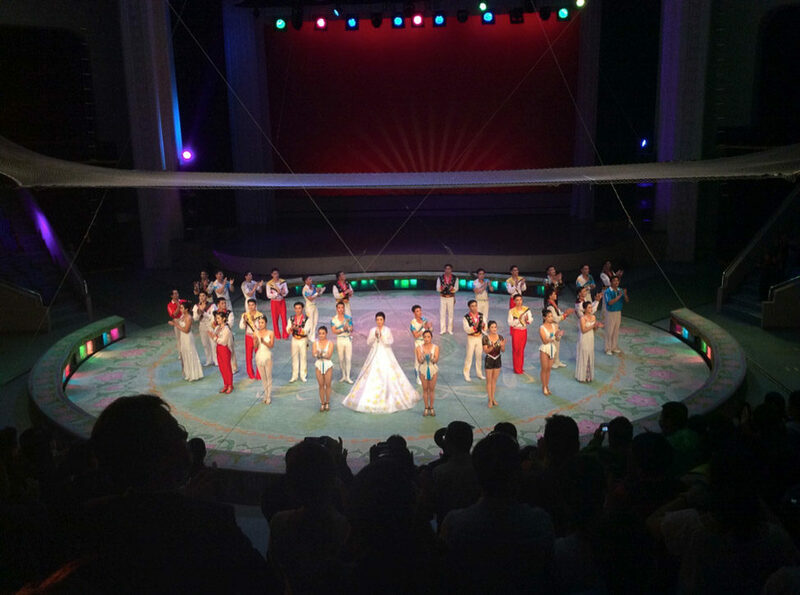 North Korea is renowned for its performing arts and you’ll see why during the Pyongyang Military Circus. It’s a one-hour extravaganza of acrobatic routine, trapeze artistry, juggling and vaulting that sees performers catapult across the stage with a display of balancing skills that’ll blow your mind. The intermission skits are militaristic in nature and keep the North Korean crowd in stitches. It’s common for foreigners to be plucked from the sidelines to join simple acts in the spotlight. Revolutionary displays of music performance and nationalistic marches are included as part of the entertainment. There are no animals used in the show. It’s simple lighthearted fun, the North Korean way! Situated on a hillside overlooking Pyongyang, this cemetery features rows of individually sculptured bronze busts of the fallen comrades that were pivotal to the liberation of Korea from the Japanese. The most famous of these is Kim Il-Sung’s first wife, Kim Jong-Suk, affectionately known as the ‘Mother of Korea’. She has reached a level of admiration in North Korea otherwise only enjoyed by Kim Il-Sung and Kim Jong-Il and her grave can be found here. School children and soldiers visit the Revolutionary Martyrs’ Cemetery to lay flowers and give thanks to Kim Jong-Suk for her heroic anti-Japanese efforts. 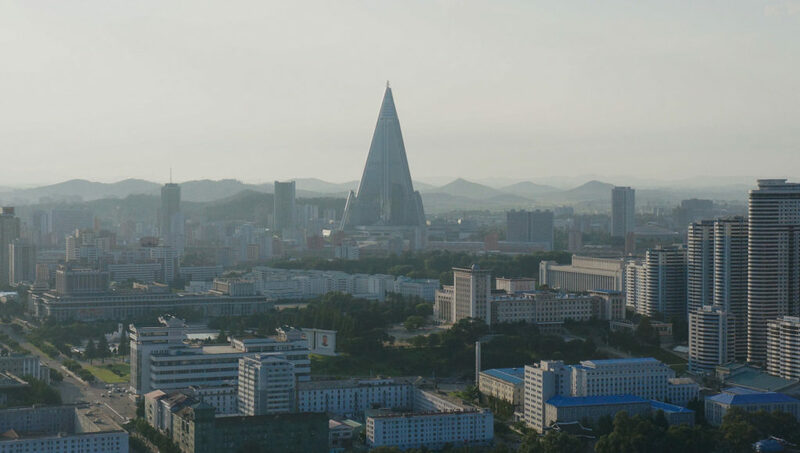 The sheer detail and impeccability of this site make it notably unique, and the view itself of Pyongyang city from the top is spectacular. The Foreign Languages Bookshop is the best place to pick up souvenirs in North Korea. 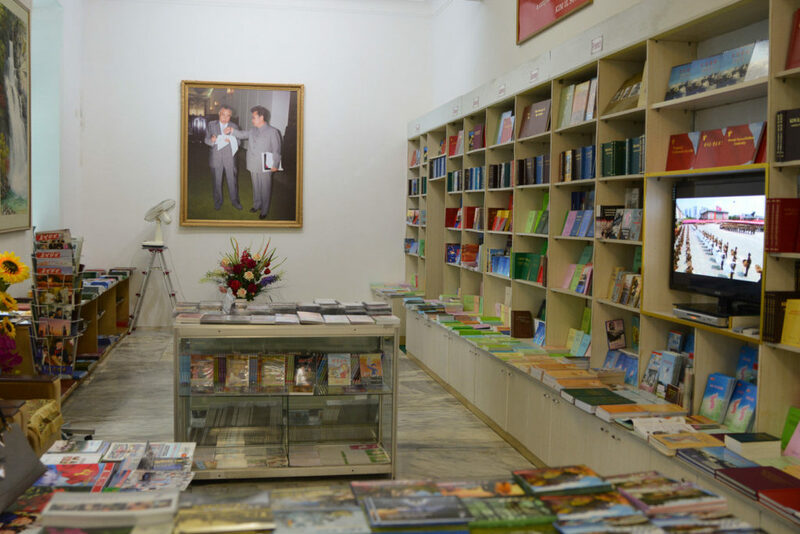 You’ll find texts ranging from Kim Jong-Il’s Songun policy, pamphlets filled with anecdotes of Kim Il-Sung’s life to coffee-table spreads with high-quality images inside the Kumsusan Palace of the Sun. The Great Leaders’ complete works have been transcribed into English, French, Chinese, Spanish and Russian and so have North Korea’s daily newspapers and state magazines. Aside from literature, you’ll find anti-American postcards, historical stamp collections, hand-painted posters and even locally distributed DVDs on Pyongyang’s iconic traffic ladies. One of the first questions you’ll ask your guides after arrival to North Korea will be: ‘What is that giant futuristic pyramid?’ This is the 105-floor Ryugyong Hotel and it dominates the Pyongyang skyline, singlehandedly rocketing North Korea’s capital into the 21st century. Construction began in 1987 and until 2009, it was the tallest hotel in the world. Originally intended to house over 3,000 guest rooms, it was never opened to the public and remains under construction, now planned to be a one-stop shop for revolving restaurants, hotel rooms, apartment rentals and business space. One can only speculate as to whether it will ever be finished and what will be inside when it is. Fancy firing a rifle or a revolver in North Korea? Meari Shooting Range was renovated with cutting-edge upgrades in 2014 and we can take you to test your shooting skills under the guidance of a female Korean People’s Army Officer. The spread of your shots is recorded and displayed on computer screens alike a bowling alley, so you can challenge your friend in the booth beside or just have the spectator’s gallery critique your technique in safety. For 20 Euro, it’s also possible to try your hand at some live pheasant that’s then cooked and served to you for dinner. Compound archery is also available here. When you’re done, you’ll take home a result scorecard for bragging rights. Come and visit North Korea’s very own Hollywood, the studio behind a plethora of domestic films fixated around the anti-Japanese struggle and the Korean War. Kim Jong-Il was a huge fan of film and is said to have even enjoyed the works of James Bond and Rambo; he visited this studio 600 times! 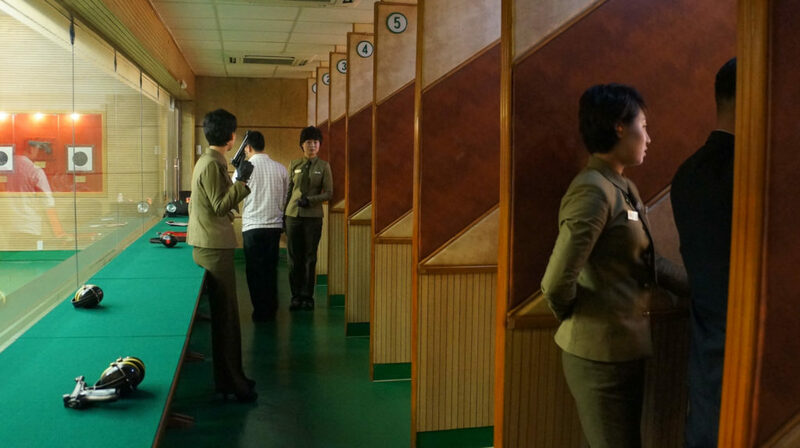 Film is a passion for many North Koreans and you’ll see cinemas scattered around Pyongyang. 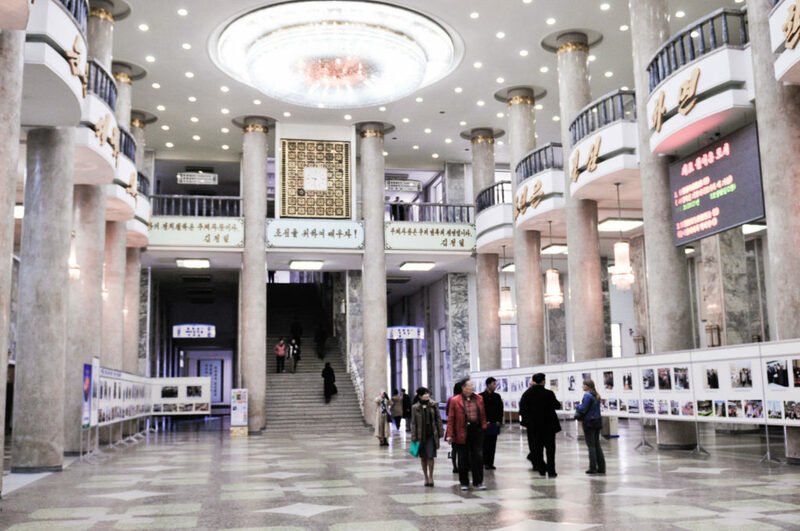 Pyongyang holds an international film festival every two years. At the studio, you’ll tour the post-production complex and the film sets replicating streets and buildings from stereotypical visions of China, Japan, Europe and even South Korea. You’ll also find villages modeled after ancient Korea and tourists are able to let their hair down here and dress up in dynastic movie props for a photo-shoot with their guides. Pyongyang Golf Course is North Korea’s only golf course. It’s an 18-hole course of international length and in fantastic condition with well-maintained fairways, sand bunkers and freshly cut putting greens. The facilities here include a lavish clubhouse, restaurant, souvenir shop and motorized buggies. 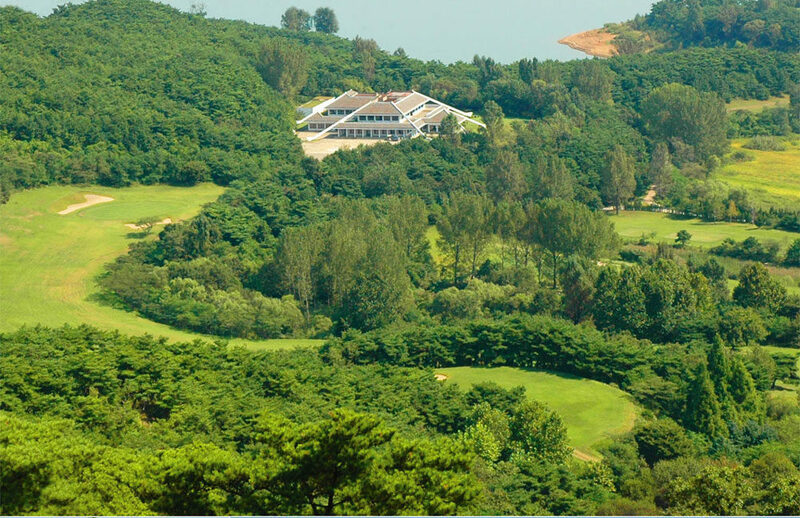 You won’t need a tee-time, the course will likely be empty and you’ll have your own personal North Korean caddy to guide you through the grassland complex. Photography is banned for the first five holes extending out into Taicheng Lake. If you’re into golf, this is the course you can none of your friends have played, guaranteed. We offer 3-night and 5-night private golf trips to challenge this course! Discover North Korea’s latest in science and technology at the new and extravagant atom-shaped Sci-Tech Complex. The buildings are entirely powered by a grid of visible solar panels. The lobby is pillared by a model carrier rocket, said officially to ‘symbolize a grand house of science’. The complex itself is filled with e-libraries, exhibition areas including an earthquake simulation room and a model operating theatre, science games for all ages, rooms designed for presentations or lectures and the latest in computer technology inclusive of touchscreen displays. Institutions and individuals are able to connect to these resources from home using the intranet. The construction of this complex and the recently completed Mirae Scientists’ Street is a testament to North Korea’s commitment to scientific development. Once a year, the Mangyongdae Prize International Marathon is held in Pyongyang and it’s one of the most incredible ways to experience North Korea’s capital. This is your chance to break from your guides and run through the streets of Pyongyang side by side professional runners from all over the world to the cheer of roaring North Korean spectators. You can compete in a full or half marathon lengths, or even a 10k or 5k race. 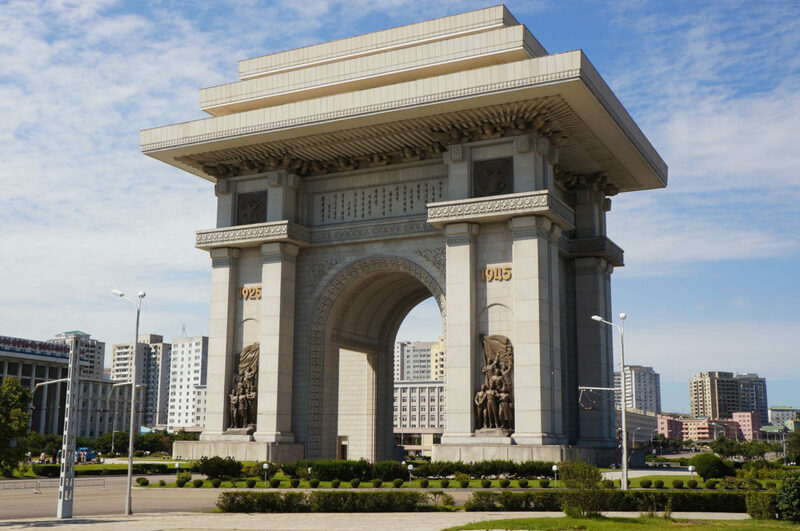 The route will pass major landmarks such as the Arch of Triumph and Kim Il-Sung Square, giving you a unique point of view otherwise not possible. 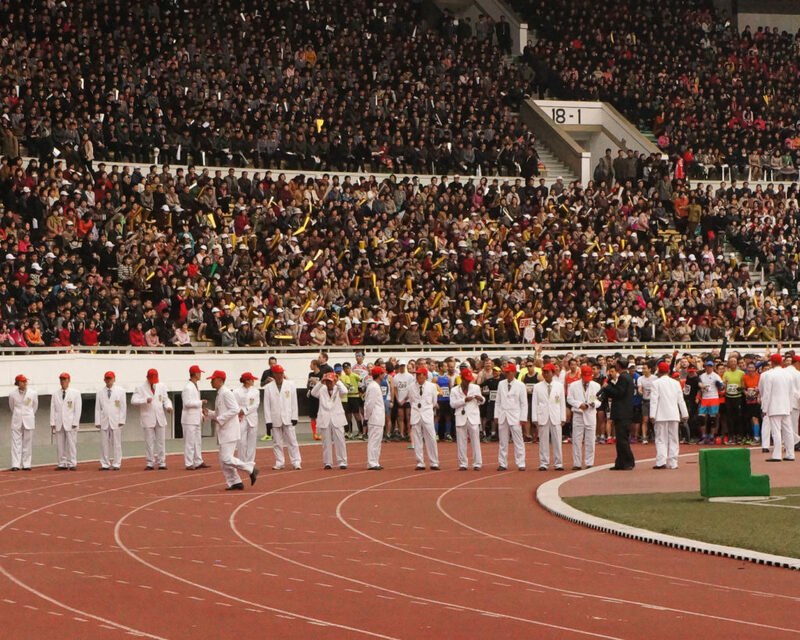 No matter your skill level, you’ll feel like an Olympic runner as you finish the race inside Kim Il-Sung Stadium to a packed house of 50,000 cheering North Koreans. The atmosphere alone is something you’ll never forget. This is a historic event and if you’d like to be part of it, we hold marathon tours during April each year and you can find the schedule here. You’ll visit many of these sights on a group tour with us to Pyongyang, and there are further sights we can arrange for you on a private tour. Want to visit outside Pyongyang? We can organize visits to 8 out of the 9 provinces of North Korea, covering all corners of the country. There is more to see than you may expect! Contact us and we will provide the available options.